The bianchetti truffle, an increasingly popular ingredient of international gastronomy. 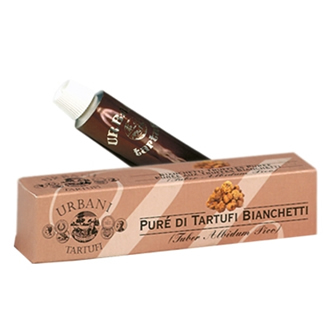 Handy tubes of ready-to-use bianchetti truffle paste. Use: As the paste is ready to use over pasta, bread, meat and fish it will appeal to the most demanding cooks. It is even better accompanied by white truffle oil or butter. Ingredients: bianchetti truffles (Tuber Albidum Pico), whole milk, salt, antioxidant: E300, E301, E330.